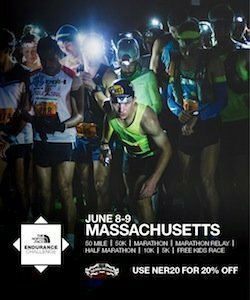 local running celebration which starts and finishes at Boston’s Faneuil Hall Marketplace. Sicuso will be presented the Will Cloney Award. starting and finishing at Faneuil Hall Marketplace in downtown Boston. of 2.4 miles, which celebrates the season. The run starts at 5:30 p.m.
event is limited to 1,000 registrants, but space is still available. Those interested in participating may register in advance at www.brjinglebell.com. Run since brothers Bill and Charlie Rodgers founded the event in 1977. Foundation sponsors two $500 scholarship awards in honor of Coach Frank D. O’Rourke. Next New England Runner Pub Series Party a Huge Hit!